This project, one in a series of projects with exhibition designer Atelier Markgraph in Frankfurt, was designed to be the flagship stand for aeronautical conglomerate EADS. 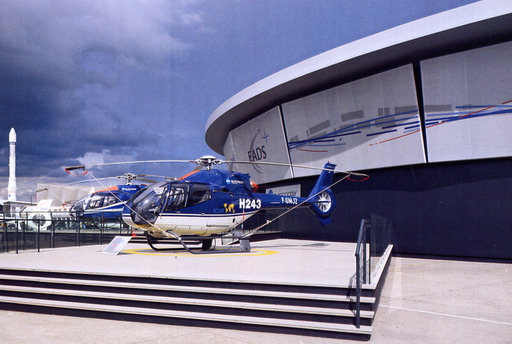 First erected on the airfield at LeBourget to last for one week during the Paris airshow 2001, the 60m diameter structure was exposed to extreme summer temperatures of up to 35°C. In addition to the hot weather, internal show lighting in the order of 1 MW and high occupancy gains had to be dissipated without compromising the internal comfort. Extensive modelling using CFD and thermal dynamic tools, were undertaken to analyse the expected internal conditions, crucial to achieve a pleasant and professional environment. The roof was designed to allow buoyancy driven ventilation via wind assisted roof vents to dissipate most of the internal gains naturally. The radiant effect of the lighting was dealt with by introducing spot cooling around the exhibits. The meeting rooms were air-conditioned via split units discretely integrated into the façade and roof.